Art of freebies is Inactive. Please direct to steffyghost.wordpress.com to see my new blog. Thanks!! Be aware that most of the content exposed here are freebies. Besides that I may accept review copies but will only blog things of my taste, won't lie to my readers.Read more info here. 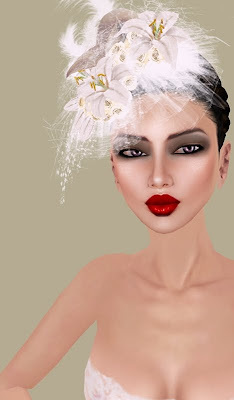 For any other questions you may contact me inworld or : My Flickr Plurk I am also human and have a RL. So if I don't blog something for lack of time is nothing personal. Hugsssss. Some shot taken with my SL default settings. If you see image in real size you can see ragged edges and we don't want this. So to end them go to : Edit-Preferences-Graphics and click on Hardware options. 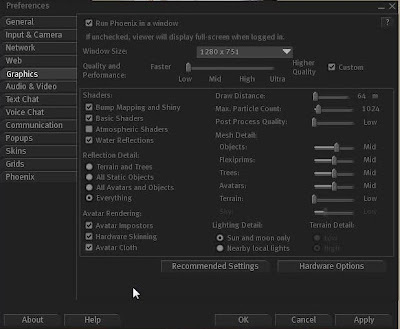 Once you have it enable the Antialiasing and set it to x4 (check if your computer can take it). Then set up the texture memory to 128. You will quickly notice some difference and no more weird edges. Enable the Advanced Menu (Ctrl+Alt+D) and select High-res Snapshot and Quiet Snapshot to Disk. Voilá. And that's how it ended it up looking. Next open you Preferences again and click on graphics. Check the Custom box. There you can select and play around and see what's the best setting for you. I do advice for those who have lower graphics to just use this to take the snapshots as it may slow down your SL. That's the options I usually select (hate Atmospheric Shaders). Ready to see the final look? I am Steffy Ghost and this is my main blog where I post thoughts and looks. :P All the images are submitted to photoshop retouch so please keep in mind demoing and seeing the designers ads before buying.